We meet on Sundays from 6:30 - 8:30 PM and on Tuesdays from 7 - 8 PM at Fellowship in Prayer, 291 Witherspoon Street, Princeton, NJ 08542, located right off of Route 27 and 5 minutes from downtown Princeton. All are welcome. See below for maps and driving directions. Newcomers, please arrive a little early for beginning meditation instruction. Dress comfortably, but please no distracting clothing. There are plenty of mats and cushions available, so there is no need to bring your own. $5 suggested donations. All are welcome. There is parking available at the back of the building, and on the street. You can enter from either the front or back door. 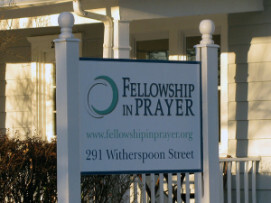 Fellowship in Prayer, a multi-faith non-profit organization, graciously allows us to use their space to practice on Sundays. Please help us repay their generosity with a small donation now or after we meditate.